This case study covers the use of Paramarine marine design software by the Marine and Technology division within Babcock. Babcock also works with other navies around the world. In the commercial sector, Babcock works on offshore renewable energy service vessels. "Using Paramarine’s damage template within the stability module enabled us to vastly simplify the conditions that need to be analysed. 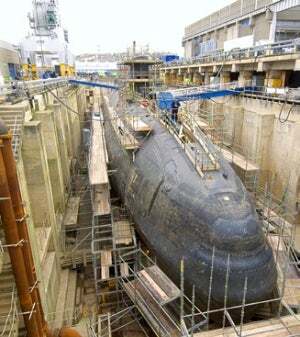 This made it easier for us to carry out complex analysis quickly," observed Richard Braithwaite, Consultant Naval Architect, Marine and Technology Division, Babcock. The data generated by these analyses are fed into Seagoing Paramarine, which allows the ship’s commanding officer to make informed decisions following damage. "Paramarine is a very powerful and robust tool and excellent for the specialised work we do on complex ships." "Paramarine is a very powerful and robust tool and excellent for the specialised work we do on complex ships. For example, we used Paramarine’s solid modelling capability to model the water jets on a super-yacht that Babcock built," said Richard Braithwaite. "The support from QinetiQ GRC is very good. For example, we can ring up with an issue and get it resolved very quickly. Their customer service is excellent and highly responsive. We enjoy a close working relationship with the Paramarine software developers and naval architects providing feedback which is often incorporated into the product," said Richard Braithwaite. "Paramarine is our marine design software tool of choice when it comes to stability and naval architecture calculations for the MoD. It is also used to develop concepts for bids. Its early-stage design module allows us to build concept designs quickly, robustly and efficiently," said Ben Munro, Principal Naval Architect, Marine and Technology Division, Babcock.